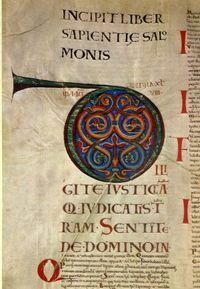 …legend holds that a monk was sentenced to be buried alive for a breach in Benedictine conduct. In order to forgo his punishment, he agreed to make the most magnificent book the world had ever seen in honor of his brotherhood. The catch was that he was given just one night to complete this Herculean task. It was first mentioned towards the end of the 13th century and probably dates from the early years of that century. 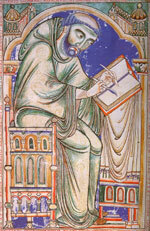 Analysis of the writing style have led to the hypothesis that the book is the work of an individual scribe. 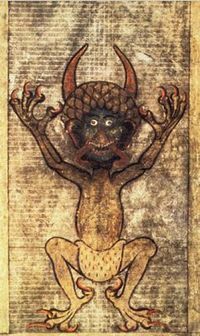 Individuals swayed by mystical thinking believe the incantations in the manuscript have real power and, when the Devil’s Bible was displayed many years ago at the National Museum of Sweden, it was attacked. Thus, considerable security and secrecy surround the current display. For more information on this beautifully illuminated manuscript, visit the National Library of Sweden website.